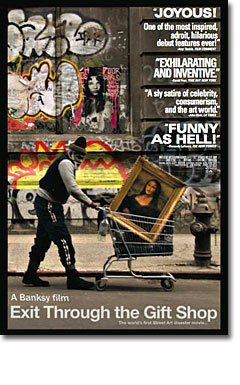 “Exit Through the Gift Shop” could be an ironic twist on the documentary form, in which the subject is forced to become the documentarian because the original documentarian turns out to be incompetent, and in which the celebration of art (in its street form) becomes a condemnation of the art world (in its gallery form). Or it could be a hoax. In which case... what? The laugh, rather than being on the art world, is on us? We are the suckers we thought we were watching. And if the latter, does this make the doc more meaningful or ultimately meaningless? This guy is Thierry Guetta, a French, vintage-clothing store owner living in Los Angeles, who has the habit, possibly from childhood trauma, of filming most of the interactions in his life. In 1999, he was visiting family in Paris, including his cousin, Space Invader, and Thierry and his video camera went on his night rounds with him. The impermanence of street art was thus recorded for posterity. This was Thierry’s entrée into the street-art world. Soon Thierry lands one of the biggees, Shepard Fairey, and follows him around for 10 months. Then he lands the other biggee, Britain’s super-secretive Banksy, “the Scarlet Pimpernel of the street art scene,” according to Cablestreet, who is famous, or infamous, for his stenciled rats, for putting up his own framed artwork in prestigious galleries, for painting a crack in Jerusalem’s wailing wall through which one can view a Caribbean paradise. When Banksy heads to L.A. and needs a tour guide, Fairey hooks him up with Thierry and his camera. Thierry’s there, filming, when Banksy stages an intervention into Bush-era America. He blows up an orange-suited Gitmo doll and places it in full view of a roller-coaster ride at Disneyland. Banksy is able to make his getaway but Thierry is grabbed by Disney security and interrogated for four hours. The absurdity of that situation—the heavy hand of the Happiest Place on Earth, along with the obvious Disney/Gitmo connection—is both creepy and hilarious. It’s as if Banksy (and Thierry) get their antagonists to dot the i’s and cross the t’s of the very point they’re making. All the while, though, there’s something off about the narration from British actor Rhys Ifans. It’s telling us a story, this story, but Ifans, sounding a bit like Malcolm McDowell’s Alex in “A Clockwork Orange,” reads it like he doesn’t believe it. There’s an ironic, sarcastic layer to everything he says. There's something off, too, about Thierry, who, in recent talking-head interviews, wears Civil War-era muttonchops and never seems particularly bright. Halfway through, the bomb is dropped. The doc he's making? He's not making it. He simply puts the videotapes in shoe boxes and never reviews it. It’s not until Banksy asks him to create the doc he’s been talking about that he tries to create the doc he’s been talking about. So Banksy, like some latter-day David O. Selznik, takes over. He’ll put together the doc, based on Thierry’s footage. And what should Thierry do? “Make some art,” Banksy tells him. He does. “I didn’t want to disappoint Banksy,” he says. So tables were turned and lessons were learned. The fake had supplanted the real and no one could tell the difference. We are revealed as a society without taste. Gore Vidal once called Tennessee Williams “someone to laugh at the squares with,” and that’s what these patrons are, squares, as is, ha!, Madonna, as is our whole culture. But you and I and the other theatergoers? We know. We’re with Banksy. Except is the story true? So what’s the lie? That Mr. Brain Wash (as opposed to, say, Banksy) created his crap art? That gallery patrons bought it? That a guy named Thierry had a predilection for filming? That a guy named Thierry exists? And if it is a lie, what’s the point of it? Most of Banksy’s art has a point. Think of that stencil of Mickey Mouse and Ronald McDonald, skipping hand-in-hand with the naked, napalmed Vietnamese girl from 1972—an image both hilarious and sickening. The best of Banksy’s art puts the blunt reality in the midst of the corporate or government fantasy. But this doc? It's blurring the lines between fantasy and reality in a way that feels like a giggle rather than a point. Or is Banksy’s point not to show us a blunt reality but to subvert comfortable norms—from Queen Victoria to art galleries—and the movie theater is one more comfortable norm he’s subverting? His art is designed to wake people up from believing everything they hear, and that includes, in the end, what they hear from him. He's now the man he's warning us about. But even this backtrack raises questions. He started recording the global phenomenon of street art? Wasn’t it Thierry? For me, it’s a little sad if the story is a lie. We already have enough lies.